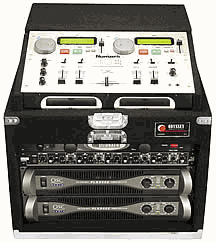 Odyssey CNMCM106 CD Mixer Rack DJParts - All Variety of Parts that DJ Needs. This carpeted combo case holds 1 Numark CDMIX 1 or CDMIX 2, and has 6 vertical spaces below for your rackable gear. Durable carpeted finish and recessed hardware. Detachable lid and front cover included (not shown). This case works great with our LTBXS rack stand.